Less than 5 short New York City blocks north of the world headquarters of Women You Should Know, an editorial office devoted to telling the untold stories of women making their own brand of history today and honoring those who came before us, there is an unassuming street corner with a street sign that marks the location of another editorial office… one of epic, WYSKy and historic proportions. Sadly, you won’t find it on typical tourist maps, and most NYers (like us) who walk by it EVERY SINGLE DAY probably don’t even notice it. So imagine our shock and disbelief when we found out about “Susan B. Anthony & Elizabeth Cady Stanton Corner”. Meet women’s historian and political consultant Pam Elam, the Woman You Should Know who single-handedly saved this corner from eternal obscurity. Her love for women’s history leads her to find important sites in New York City where women made history. 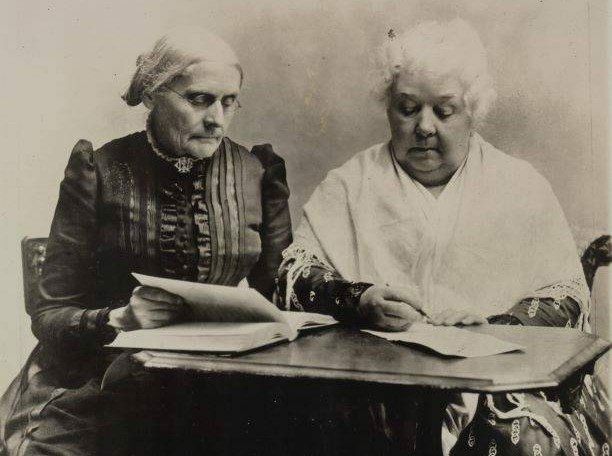 One such site was 37 Park Row, near City Hall in lower Manhattan, where the building once stood that housed the editorial office of the two pioneering women who were the driving force behind the women’s rights movement… Susan B. Anthony and Elizabeth Cady Stanton. After forging separate fights for women’s rights, temperance, and anti-slavery programs, Anthony and Stanton joined forces in 1851, and went on to become the most powerful team in women’s history, ultimately forming the National Woman Suffrage Association in 1869. From 1868 to 1870, this dynamic duo edited and published their women’s rights newspaper –The Revolution – from that 37 Park Row office. According to reports, each day, Stanton walked up and down the steps from her office to the printer at 37 Park Row, carrying articles for the weekly publication. Imagine if THOSE walls still stood and could talk? But 135 years later, with the original building and the two female trailblazers who once graced its halls gone, this rich history was altogether lost to a Starbucks (technically, their address is 38 Park Row). That is… until Pam Elam launched into action. She told WYSK, “I felt it was outrageous that New York City had never officially honored Anthony and Stanton. So in 2003, I proposed a street sign honoring them near that site.” Determined to right this egregious wrong against women’s history, Pam rallied support for her proposal from the local Council Member and Community Board, then testified for the legislation, which was introduced and later adopted on April 21, 2004 by the City Council. Needless to say, we will never walk along the east side of City Hall Park near 37 Park Row again without taking a moment to think about these awesome women and all the extraordinary things they accomplished with eloquence, tenacity, and unbelievable bravery so long ago. After all, where would we be without them? Special thanks to Pam Elam A) for letting us know about this special corner and B) for working to preserve its legacy. Tomorrow, February 15th marks the 194th anniversary of Susan B. Anthony’s birth. So this is our Happy Birthday ode to her! We leave you with Pam’s favorite SBA quote.